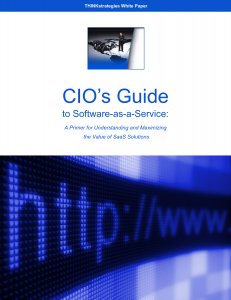 CIO Guide to SaaS – “I wanted to compliment you on this document. This was the best write up of the benefits of SaaS I have read yet. Well done!” Doug McGregor, CEO, WebEquity Solutions. “SaaS Market Surging”, “Customer Concerns Continue to Constrain SaaS Growth”, and “SaaS Market Proliferation: Buyer’s Market or Industry Shakeout?”, customer survey reports in conjunction with Cutter Consortium. “SaaS Penetrates the IT Department”, “SaaS Market Accelerating” and “SaaS Market Shifting from Point Solutions to Platform Strategies”, joint survey reports in conjunction with Cutter Consortium. “How SaaS Is Overcoming Common Customer Objections”, a joint survey report in conjunction with Cutter Consortium. “Spreading SaaS: Horizontally and Vertically”, a joint survey report in conjunction with Cutter Consortium. “SaaS Appeal is Growing”, a joint survey report in conjunction with Cutter Consortium. “Enterprises Seek New Choices in Managed Services”, a joint survey in conjunction with Business Communications Review and CMP. Utility Computing: Are Buyers from Venus and Vendors From Mars? A Perceptual Gap Analysis Report. Click here to request a free copy of this report. “Out-Tasking as an Alternative to Traditional Outsourcing”, An Email Advisor published by Cutter Consortium. “SaaS Alternatives and Adoption Still Perplexing, But Worth Considering” An Email Advisor published by Cutter Consortium. “Do Demographics Matter in the SaaS Market?”, in conjunction with Cutter Consortium. “Selecting the Right SaaS Provider to Meet Your Business Needs”, in conjunction with Cutter Consortium. “Software-as-a-Service (SaaS) Survey Shows New Model Becoming Mainstream”, in conjunction with the Cutter Consortium. 2005 Managed Services Industry Benchmarking Study, in conjunction with the MSP Alliance. “Utility Computing: A Reality Check and Prescription for Success”, on behalf of Cutter Consortium. “Backsourcing: Why, When and How To Do It”, in conjunction with Cutter Consortium. Contact us if you’d like to learn how you can leverage THINKstrategies’ research capabilities to help you achieve your corporate objectives.